A long time ago in a galaxy far away, I was a student at a music conservatory. I stayed long enough for the administration to give me two degrees. But don’t worry–that doesn’t make me particularly musically informed. I was a singer. One of my favorite professors was a young composer who attempted to demystify music for us. I vividly recall how he gently mocked those who walked the halls, clasping their Mozart, Beethoven, Bach scores to their bosoms as if these were sacred texts. What he was saying, and attempted to illustrate through rigorous analysis of musical scores, was that great composers are great craftsmen first. And you should learn that craft in order to appreciate it, not taking your cues from what musical “elders” tell you is worthy of your time and appreciation. His point electrified me, a girl from the ‘burbs with little formal training in music outside of piano and vocal lessons through childhood and beyond. So much of the classical music world seemed like an exclusive club to me at that time. He seemed to be saying that folks like me could get into that club. We just needed to study and study and perform and learn. I still have the marked-up editions of Chopin’s Ballades that we went through during one semester. It was like doing a difficult puzzle. Oh, my skill level still falls far short of most instrumentalists, and certainly of that teacher — he could sit at a piano transcribing to the keyboard an orchestral version of The Rite of Spring…while lecturing. The deeper lesson he imparted, however, was this one: if you merely clasp great art to your breast with whispered sighs of adoration and no understanding, you are not sophisticated. You’re just…a snob. Understanding comes on different levels, though, and I’m not about to cast stones at those who aren’t musically trained but can still appreciate art of any kind. I have friends and family who don’t know much about the mechanics of music but genuinely love and appreciate works by various classical composers, favoring some over others, just as they like certain popular artists more than others. I’ve not asked them about their preferences, but I suspect their appreciation and affection for certain works is due to these elements within the pieces: familiarity and surprise. We like music that offers just the right combination of familiar sound patterns and surprising twists on them. Much Asian music literally “falls on deaf ears” for Westerners, for example, as we are not familiar with those sound patterns much at all. But familiarity can breed boredom, if not outright contempt, so composers who manage to stretch listeners’ expectations with pleasant surprises appeal, while those who go too far astray, from our own personal familiarity, don’t. The neuroscientist Daniel J. Levitin explains this and more in his excellent book This Is your Brain on Music. So, even someone not schooled in music can still explain that Vivaldi bores them because it’s too repetitive, Puccini moves them because his works are so lush — even if they think La Boheme too sentimental — and Schoenberg is as dry and uninteresting to them as a desert. They have some understanding of their preferences, even if they aren’t telling you Vivaldi’s repetitive melodic patterns border on the minimalist while his harmonies are no more complicated than the latest pop song’s, and Puccini’s operas delight and move when they are complex and clever but sappy when the great composer uses his skill to exploit your emotions. As to Schoenberg, he wrote twelve-tone music. Nuff said. Now, that song does make me sigh. And this version of it. Not Debussy’s so much, where I can imagine some jaded French fellow smoking a cigarette while reciting the words to the woman he’s trying to woo (or managed to seduce). By the way, speaking of musical asides, I get a big kick out of the fact that Leonard Bernstein begins the song “Maria,” whose first line is “Maria, the most beautiful sound I’ve ever heard,” with the vocalist singing the ugliest sound in music — the raised fourth. It’s considered so abominable that it’s referred to as the diabolus in musica — the devil in music — and if you want to hear it, just imagine in your mind’s ear the klaxon calls of police cars in Europe. Yup. That’s it. And I smile whenever I sing Handel choruses because he was such a showman, writing just enough of a fugue pattern to make listeners think he’s going down Bach’s road, but then marching off in a different direction, abandoning that theme, until he brings it back later to wrap up his deception. I think of Handel as the Andrew LLoyd Weber of his time, composing works of complexity and even nuance, but always with his eye on the public. The point of my long ramble today is that I began my music education feeling inferior and unsophisticated, but I learned, especially with the help of that music theory professor, that sophistication is understanding — whether it’s understanding of a classical piece or a popular one, knowing why you like it and being able to articulate it. Merely saying something’s great because a) it’s not popular music; and b) lots of other experts say it’s great isn’t sophistication. It’s snobbery. To round things out, here’s another favorite of mine. It speaks to me, especially the line, “Tell me, are you a Christian child. Ma’am, I am tonight.” That’s how I feel when I find music that moves me: converted to the composer’s point of view. Libby Sternberg is a novelist. Please buy her books so she can buy more music. Advice for the day: Do not settle. What my driver’s license photo often resembled. 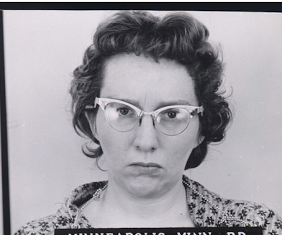 Year after year, I’ve reconciled myself to the awful mug-shot-like driver’s license photos that dampen any joy one might experience at the moment one must pull the darned license out for identification. I could be purchasing the Best Outfit Evah, absolutely sure it will Change My Life in Epic Ways, filled with the elation that justifiably accompanies such a momentous occasion, but then…”Could I see your driver’s license, please?” The ID check brings the awesomeness to a screeching halt. Out it comes, and there, staring me and the store clerk in the eyes is The Truth–this woman cannot possibly have her life changed in epic ways by ANYTHING because she looks like a fugitive. I half expect the sales clerk to say–after an embarrassed little titter, of course –“What, they didn’t have any more orange jumpsuits that day?” Ah-ha-ha. Ha. Ahem. Three years ago, I made the mistake of having my license photo taken sans wig. 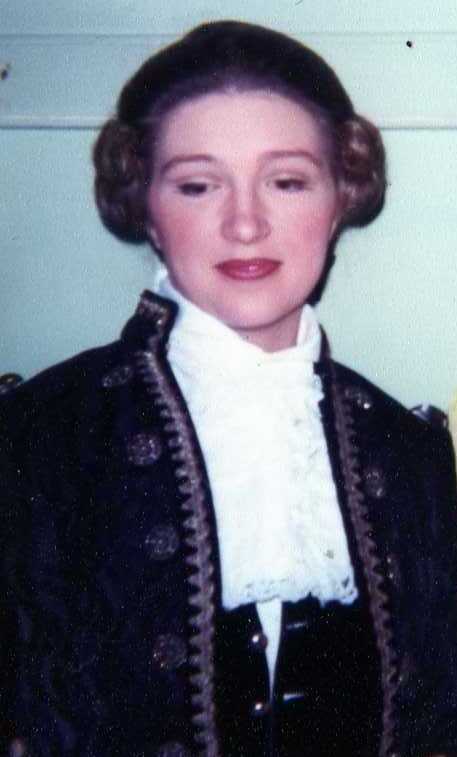 My hair was scalp-close then, see, because of a treatment that rhymes with dreamotherapy but is kind of the opposite. I thought at the time that this shorn-locks look would be a triumphant remembrance of the victory I felt at the end of that treatment slog, a badge of honor, sort of like a tattoo that one gets to mark a significant act of bravery. What I aspire to look like in my driver’s license photo. So, this year, no mug shot for me. Nuh-uh. No shorn locks. No staring into the camera like the proverbial deer in the Ugly-Magnifying headlights. First up: makeup. Not just everyday makeup, but eeeeeevvvvvvening makeup. The kind you used to wear on dates. Or the first year you were married. 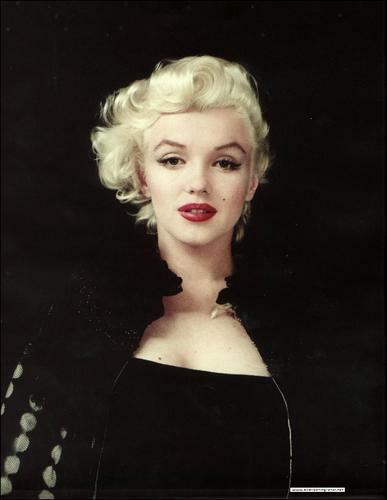 A nice foundation, some subtly applied rouge to your cheekbones, once you locate them again, and then….eye shadow , eye liner (quick, straight lines above and below), mascara (the volumizing kind advertised in those commercials that make skimpy eyelashes sound like a physical disability for which there is a government program!). Second up: Clothes. Pick out your best top. I recommend sparkly, chiffony, satiny or something pink. In my case, it was a Chicos purchase from a couple years ago, something I bought not on sale to celebrate a book deal optioned for film, that has so many sparkles around the neckline that you have to wash it by hand. (Not that I ever do, mind you. Wash it, that is.) Wear any ole jeans or scruffy pants or skirt. It’s only the shoulders up that count. Thirdly: Accessorize. Since my top was sufficiently bedazzled, I opted for no necklaces, but I wore the shimmering earrings I’d sported at my son’s wedding two years ago. Everything’s better with sparkly jewelry. Fourthly: Hair. Two words: Curling iron. Oh, two more: Hair spray. Nuff said. The result, I have to say, was all I could have wanted. The photographer complimented me. I was ready for my close-up, and I only needed one take. And…I look like someone who is not headed for a penal colony. I’ll proudly whip out that photo now. So, do not settle for those dull, ugly driver’s license photos. Go fabulous. I only wish I’d taken my feather boa…..
Libby Sternberg is a novelist. She likes sparkly things but can only afford them if you buy her books. I have many cousins, but most live far away. One, however, is but a half hour’s drive from us, and it is a great joy to see Bill regularly for barbecues, family dinners and more. He has a mischievous sense of humor that translates into creative rule-making during summertime games of croquet (“Everyone with a hat on gets an extra turn!”), and he always brings…door prizes. 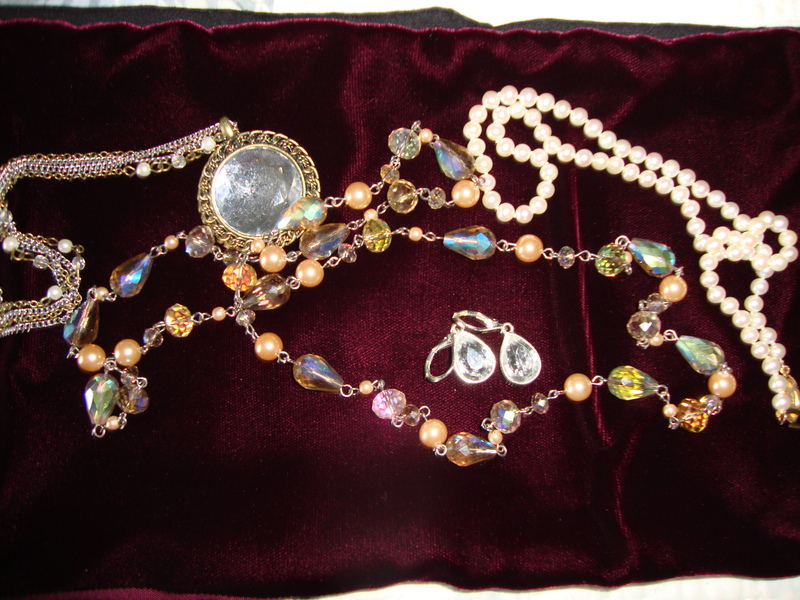 A flea market aficionado, he brings a box or two of his finds to gatherings. After the meal, we’ll play a game — croquet if the weather’s good, Bananagrams or charades for other days — and door prizes are won by the victors. Or sometimes by the vanquished. Depends on the prize–one of our rules is that you can either choose a prize for yourself or bestow one on another guest. Bill’s one rule is: If you discover the prize has value, don’t tell him. I’m proud of my door prizes. 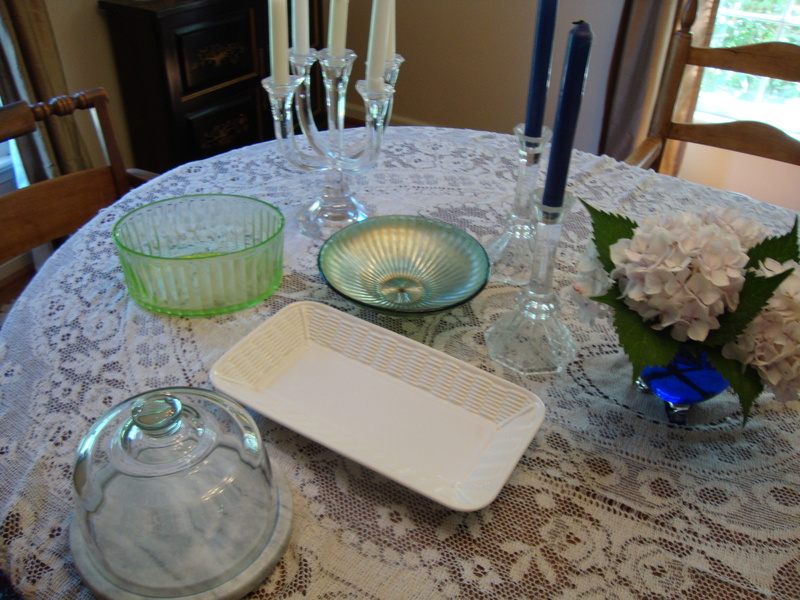 I treasure my wins, which include a domed cheese dish, a rectangular serving plate I use often, a decorative bowl, several spectacular vases (one of green glass, the other blue) and a few candlestick holders. Contemplating these wins made me realize how much of my household is decorated with hand-me-downs. I’d say a good 80 to 90 percent of each room is furnished with pieces given to us by family members, from the gorgeous Belgian rugs in living and dining rooms to the end tables in the family room, to the headboard and bedframe in our bedroom. Of the few pieces of furniture we’ve purchased on our own, several have come from a consignment store where I love to shop. 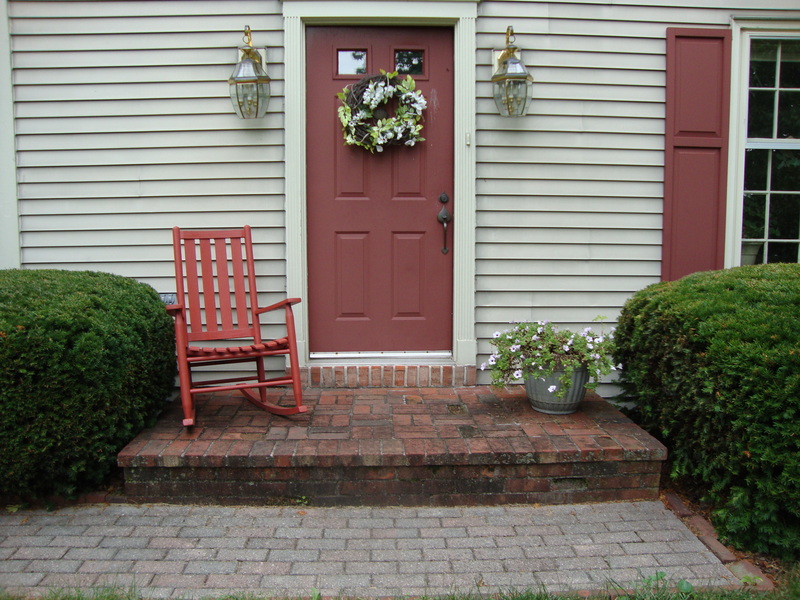 The repainted chair and the plastic planter. I enjoy using found pieces outside, as well. On our front porch sits a rocking chair a neighbor was giving away for free (I took it and repainted it), along with a big old plastic flower pot my middle son had used in his college apartment for a bamboo plant. I use it for flowers; its, well, cheesiness, is somewhat obscured when viewed from the road. 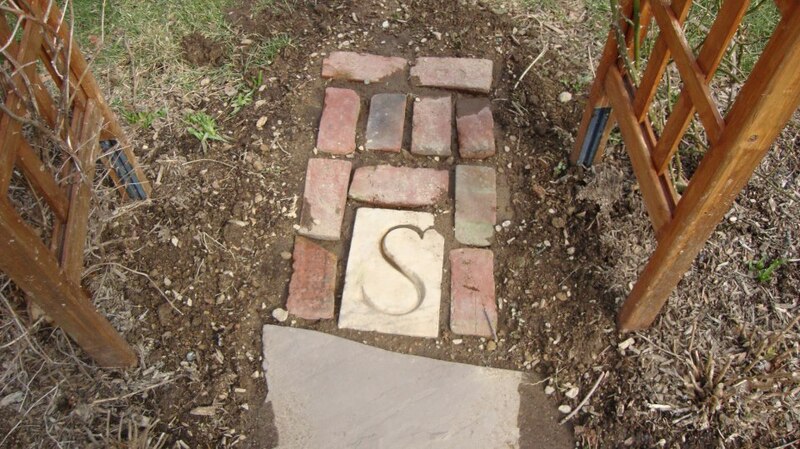 I’ve used flagstones and bricks found on our property for pathways, too. Early in our marriage, I felt acutely the challenge of not having enough money to adequately decorate. But now that we can afford to buy pieces, I find myself cherishing the used items that have come our way, and I think I’ve done a good job of integrating the pieces into a pleasing decor. In fact, I feel a little bit guilty buying new things when so many wonderful used pieces are on the market. Now, when I look at the barrel-back chair in our living room, I remember crawling into it as a child, seeing it as the sheltering symbol of unconditional parental love. When I view our love seat and piano, I think of my very special mother-in-law. When we gather around our dining room table, I remember sitting at that table as a newlywed when my in-laws lived outside of DC. Each piece tells a story. If I had all the money in the world to redecorate, I’d probably keep things as they are. Libby Sternberg is a novelist. TGIW=Thank God It’s Wednesday. This must be how they get in. 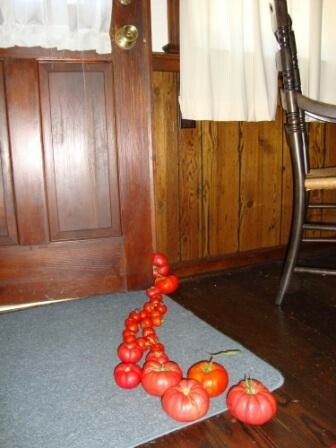 The tomato army has arrived. They’re stealthy. We find them hiding under foliage, glinting red in the shadows, just waiting. Waiting to march, to attack, to take over….at least the kitchen. Although we only have a few tomato plants, they produce baskets full of fruit. Which reminds me of that old adage…Knowledge is knowing the tomato is a fruit; wisdom is knowing not to use it in a fruit salad. (Or maybe wisdom is knowing how to use fruit and tomatoes together.) But I digress…. Having so many tomatoes finally inspired me to do something I’ve never ever ever ever done before. In my entire life. That is….peel a tomato! 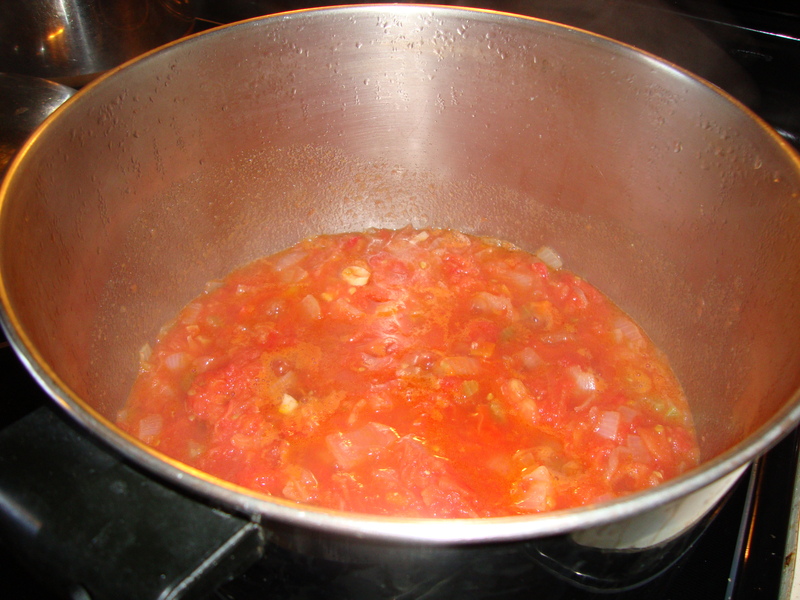 To make tomato sauce from scratch. Peeling a tomato, it turns out, is pretty easy. You need to shock them, and they lose their skins faster than Joe Nichols’s girlfriend sheds her clothes after throwing back some Patron. For 6 people, use 6 ripe tomatoes, 1 can peeled tomato, half bunch of basil, half bunch of parsley, 5 garlic cloves, 3 oz of parmigiano cheese, 3 oz olive oil, salt and pepper. Dip the tomatoes in hot water for few minute, then peel and chop in very small pieces, chop the can tomatoes and use the juice, too; chop the rest of the ingredients and mix everything; taste if you need more salt and olive oil. Add oregano. I ended up at Smitten Kitchen. They have pictures! So I was able to see what the tomatoes are supposed to look like, etc. Here’s the link to their recipe. The sauce before it was blended. At the end, I blended all my sauce ingredients in a food processor after cooking. And I have to say, we really enjoyed the result. The sauce actually tasted like….tomatoes! Not like salt, not like sugar, not like something with a metallic overtone. Next time, I’ll follow my daughter-in-law’s father’s instructions because I think mine could have used more garlic and basil. And there will be a next time. The basket is already full with another army of tomatoes. In case you’re wondering where the title of this post comes from, it’s the title of an epic film that, oddly enough, never won any Oscars. I’m particularly fond of its catchy theme song. Libby Sternberg is a novelist. Please buy her books so she can buy more tomato plants next year. I like to be entertained. So, even if you’re selling something, I’ll listen if your pitch is funny, compelling, artistic, worth spending 30 or 60 seconds on. That said, I get a bit annoyed at TV ads that are richly entertaining yet don’t make their product or service memorable in a good way. It seems like such a waste of money. And since advertising costs get passed along to the consumer, I like to know that what I’m buying was produced at a company where smarts and quality go hand in hand. While this is among my favorites lately, I have my share of abominables, ads that trigger a race to the mute or channel switcher buttons. One is the Liberty Mutual Insurance spots with their Paul Giamatti narration about the foibles of “humans.” Foibles such as cutting off tree branches that crush your neighbor’s car, or driving into your garage, forgetting you have bikes on top of the van, or…you get the picture. The message seems to be that if you’re kinda stupid, Liberty Mutual’s the insurer for you. Maybe they’re a good company. I don’t know. But I do know I don’t want to be paying for stupid. It’s sure to drive up rates, right? Liberty Mutual seems to have gone through an identity crisis of sorts. Just a year or so ago they seemed to be touting “responsibility,” first with commercials showing good-hearted folks helping each other out in small ways, then with a series of grim spots centered around a family going through tough times, sort of a suburban Joads-meets-insurance-company-here-to-help narrative! Smart move to get away from those befuddling messages, but the latest effort often has both my husband and I shouting at the feckless humans making those dumb mistakes: “Stop, stop! Don’t cut off the tree limb without looking where it will fall, you bleepity-bleep.” Me and hubs–we’re always cracking each other up. Another bad-messaging ad is the Lays potato chip one where a woman sits in a salon having a manicure and is so tempted by a Lays-chip-eating patron nearby that she snarfs down some chips, off-camera, leaving the oily residue on her just-polished nails. Why, I ask you, would a company want to remind you of the downside of their product–it’s messy and greasy. So, is this spot the beginning or the end of a story? If it’s the end: He’s a Scarlet Pimpernel-like character whom she first thought was a cad or weakling, and now it’s revealed he’s the dashing good guy, come to whisk her off to safety. If it’s the beginning of the story: He’s a Svengali-like villain taking away the Ice Princess while her Prince readies an army to rescue her just off stage. Works for me. What’s your story for these two mysterious characters? That’s it for today’s TGIW–Thank God It’s Wednesday–post! Feel free to tell me what TV ads you love or loathe in addition to any narratives that strike your fancy for that Lexus couple! Libby Sternberg is a novelist. She doesn’t have enough money to place television ads, so buy her books and make her happy! When I was a child, my mother would put my sister and me to work scrubbing down the kitchen walls during spring cleaning. We used buckets of soapy water which I imagine contained some grease-cutting detergent. I remember it smelled….clean. But heck if I recall the actual dirt and grease on the walls. For all I could see, we were just wiping spotless surfaces. 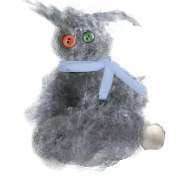 I’m told this is a dust bunny. I see nothing. Have company. Dirt blindness seems to recede in the fifteen minutes before any company arrives on your doorstep. This strategy has the added benefit of giving you a high-power workout as you scurry to get rid of the dirt you can finally, finally see in that short window of time. Change your light bulbs: Amazingly, a higher watt bulb can sometimes illuminate dirt for brief periods (up to five minutes if you’re lucky). Please note, however, that this is temporary and curiously only works in the area immediately near the light. Hire a maid. Technically, this doesn’t get rid of your Dirt Blindness, but it does make life easier for the rest of your family, so they don’t have to suffer with you. And, strangely enough, while Dirt Blindness makes it impossible for you to see unclean surfaces, you are able to appreciate, in all its splendor, a sparkling clean house. I’ve learned to cope with my Dirt Blindness over the years, mostly through acceptance of this sad affliction. I hope my ideas help others who’ve been cursed with this syndrome. Please, feel free to share your own strategies for dealing with this problem, if you are a fellow sufferer. Libby Sternberg is a novelist. In lieu of contributions to the Dirt Blindness Association, please buy her books. That temporarily lifts her Dirt Blindness Ennui, a secondary syndrome caused by the primary disorder. Check back this Wednesday for the TGIW post on television ads to love and loathe.